We moved the boat to a deeper spot; I submerged down the anchor line and hit the bottom at 50 feet. My computer had broke, so I used the tables to guestimate my time; we had to wait for another diver to return to the boat from the last dive – he swam to the wrong boat and had a hell of a surface swim back. I caught a bug pretty early in my dive and then pinned two monsters; vis was clear, up to 15 feet. 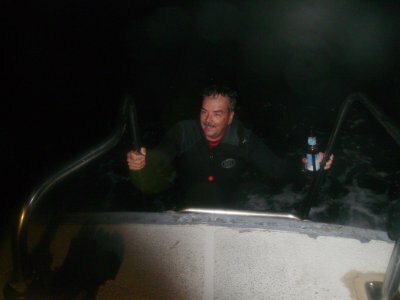 I made it back to the boat; two divers were still on board – one was sea sick and didn’t make a second dive, the other didn’t feel like making another dive, but hung out with Rolando and helped to prematurely deplete our beer supply. Dan and Hot Biker Chick Donna made it back with three bugs. For some strange reason, Dan had to go back in the water, at least to waist level. 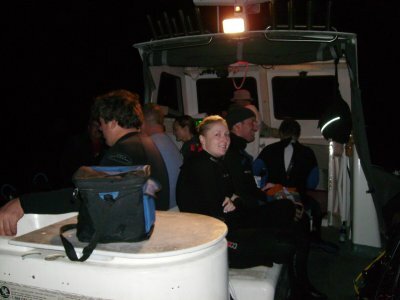 The other divers made it back; Hollywood and Mike C. limited, while others got one or two bugs or even got skunked. The ride back was a typical debrief; we all agreed that the lobsters have gone deeper. I pose with my catch for the night; sucking my gut in makes me look like I have three double chins. Debriefing continued at Rocky Point; some really weird, but hysterically funny, conversations ensued. 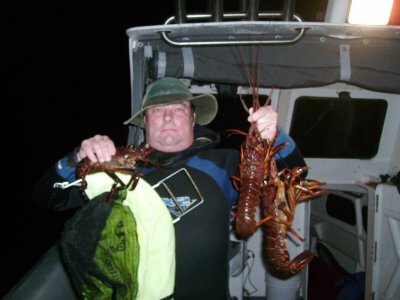 This night, eight divers caught a total of 20 lobsters. Do the long codes under the heading “secret location: actually mean anything or are they just for entertainment purposes. I tried to figure one out and ended up in Guam. It was a long ride for a 17′ center console. Maybe I’m not as good a code breaker as I thought.